Cathy offers workshops and classes in her studio/gallery and classroom–Studio 41–at Artists & Makers Studios (11810 Parklawn Drive, Rockville, MD). Designed for the beginning and intermediate painting student, Cathy’s workshops and classes fit students interested in working in various media–watercolor, oil, acrylic, gouache, and mixed media–whether they want to paint realistically or more abstractly. The sessions are designed to give students foundational knowledge as well as practical skills to help them make progress with their artwork. 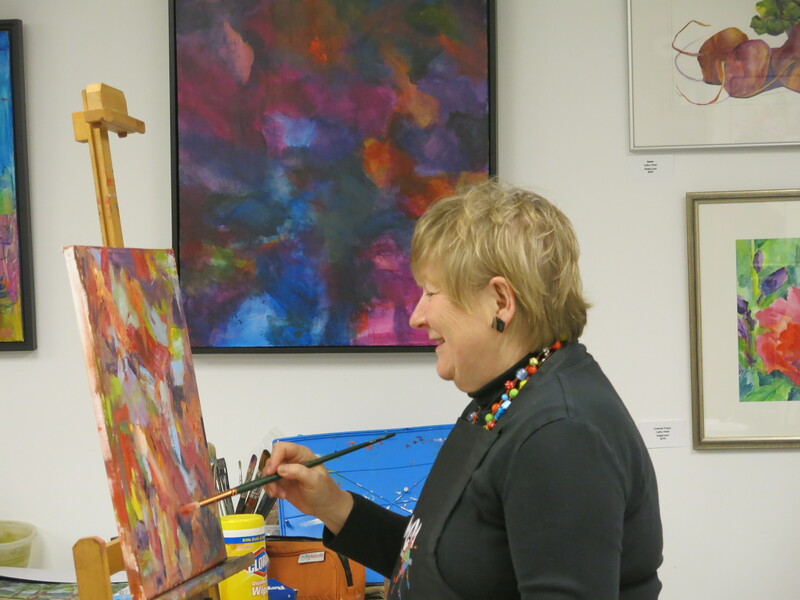 New to art instruction in 2015, Cathy is nonetheless an experienced teacher. In her previous career, she designed, developed, and taught technical and management topics to domestic and international audiences. She knows how to explain and demonstrate complex topics so that her students understand and are able to apply the lessons. If you should have any questions, or would like to register for one of the workshops or classes, please contact Cathy at cathy@HirshStudio.com. If you are interested in a workshop, contact Cathy to let her know the workshop and when you would like to take it. Cathy reviews the requests she has for that particular workshop in that time period, reviews her schedule, and then works with prospective students to determine a schedule that will work for everyone. Cathy is flexible and has taught to just 1 student, although more is optimal. She teaches on weekdays or weekends depending upon student preference. A class handout and workshop materials, and in some cases, art tools for future student work, are included. 1 day ($150) or 2 day ($200) workshop with all supplies included. Students also receive art tools helpful to their future painting efforts. For the beginning and intermediate artist. An excellent way to begin or continue painting lessons. Strongly suggested for all students–regardless of the media they plan to use (or are using) or the type of art they want to produce (representational, impressionistic, or abstract). Covers art fundamentals (composition, value, color theory), contemporary media, art supplies, and resources, sketching methods, key references, framing tips, and other tools/techniques–all topics important to help emerging artists achieve success from the start. This class is approximately 50% lecture and 50% exercises. Class exercises reinforce the lessons covered and also includes painting exercises using different media (watercolor, oil, acrylic) to allow student experimentation and to help students decide what medium they want to explore further in the future. Depending upon student interest, it can be given as a 1-day session, 9 to 5, or as a 2-day session, 10 to 4 both days. Cost for the 1-day session is $150 and for the 2-day session $200. The content for both the 1-day and 2-day sessions is essentially the same, but the 2-day version presents the material with a shorter day schedule and also provides additional time for more reinforcing exercises. Additionally, students receive a number of important art tools that will be helpful in their future painting efforts. Limited to 5 students/session. 1 day hands-on workshop with all supplies included. $150. There are as many approaches to abstract painting as there are abstract painters. What makes a good abstract painting, where do artists get their inspirations, and how do artists grow their abstract painting skills? The components, processes, and techniques used to create and evaluate abstract paintings will be reviewed. Students will create three paintings using acrylic paint and three different techniques. All supplies included. Limited to 5 students/session. Techniques in collage, layering, and mark-making will be explored while students create 2 mixed media pieces using provided materials and tools. Students will also learn how to create their own unique collage materials, stencils, and stamps that they will take home for use in making future mixed media art pieces. Supplies included. $180. Limited to 5 students/session. Flowers come in all shapes–spheres, disk-shaped, cone-shaped, and sometimes a combination of all of these. We will explore the techniques available to the artist to render good images in each of these cases. Single flower set-ups and bouquets will be provided. Cathy will also provide demonstrations as well as coaching and critique. Students will bring the media, supports (canvas/paper), and tools (brushes/palette knives) of their choice. $150. Limited to 5 students/session. Note: this workshop does not repeat topics covered in the QuickStart to Painting Workshop. Students new to watercolor are encouraged to take BOTH workshops. This class is mostly hands-on with teacher demonstrations and student painting. Key watercolor techniques are shown, and then students complete exercises using the demonstrated techniques. In addition to the technique demonstrations and practice, students also paint a flower and a landscape using the techniques they’ve learned. All supplies included. $125. Limited to 5 students/session. Thursdays 1 to 4 pm. Enjoy a friendly learning environment while building your painting skills! Each class includes a discussion of a key concept or a technique demonstration followed by student painting time with teacher interaction/class review as appropriate. Because painting still lifes and florals is an excellent way to build artistic skills in technique, composition, and color, there will be a still life or floral setup available for most classes. It can be a terrific skills builder. Students may paint the still life/floral display provided, use photographs or other subject matter, or paint abstractly, if they prefer. Cathy is also thinking about offering a similar class Wednesdays, 9:30 to 12:30. If you are interested, please let her know!